I’m not sure what museum this picture was taken from (or was it at the National Historical Institute). There’s a brief note written at the back of this picture. 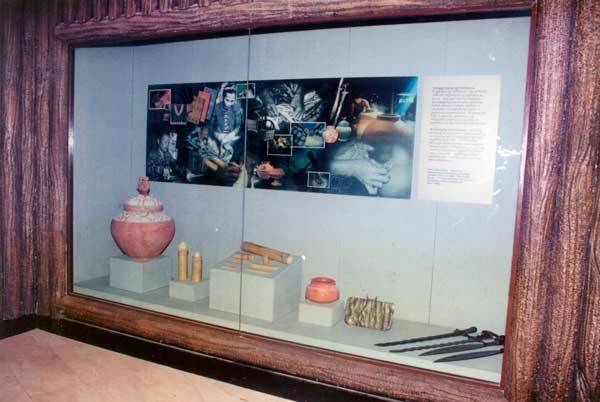 The showcase for pre-conquest history of the Philippine includes a replica of the Manunggul jar, Ambahan writings on bamboo tubes, Calatagan jar and Laguna copperplate which contain ancient inscriptions. This entry was posted in Artifacts, Historical sites and tagged ambahan writings on bamboo tubes, artifacts, calatagan jar, laguna copperplate, manunggul jar, National Historical Institute on April 4, 2011 by Yami.